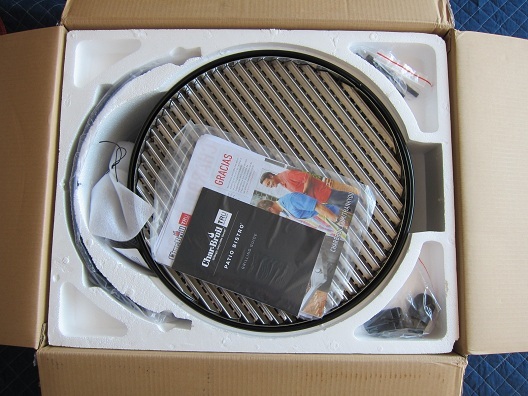 This week’s review is on the Char-Broil Patio Bistro Infrared Gas Grill from Char-Broil. The Char-Broil Patio Bistro Infrared Gas Grill has a black porcelain finish with a nice compact design that is perfect for small porches and balconies. It is also very easy to move and store. This grill has a 12,ooo BTU burner system and a total cooking area of 320 square inches which should be plenty of cooking space for around four people. 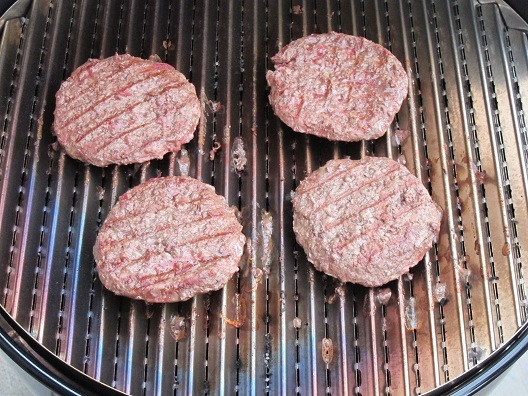 The Char-Broil Patio Bistro Infrared Gas Grill has an easy-to-light integrated electronic ignition and a stainless steel cooking grate as well as a small warming rack. 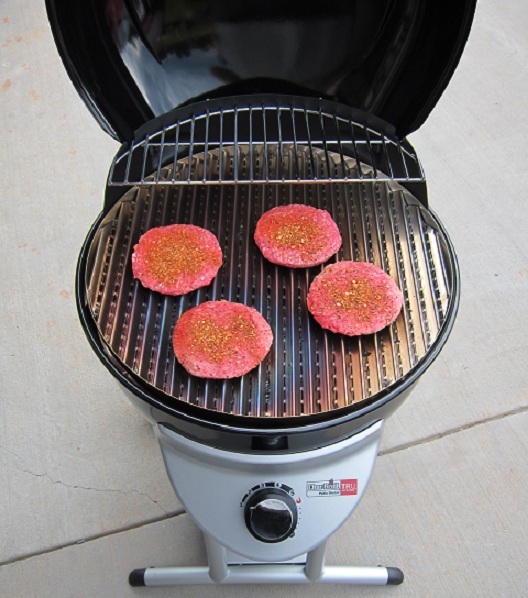 This grill is Made in China and available through many retailers. 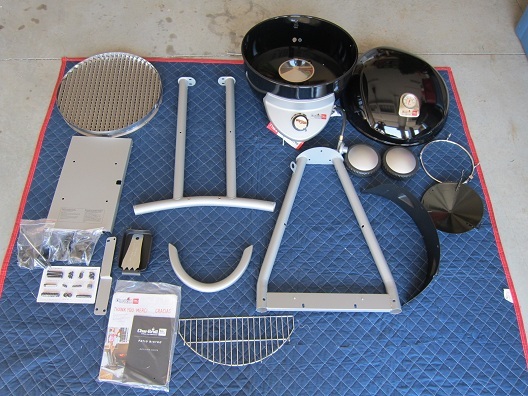 After opening the box for this grill it took a little over 45 minutes to assemble. Below are some pics of the grill fully assembled. 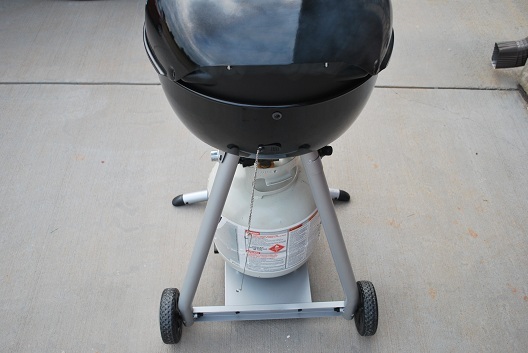 As you can see in the picture below, the propane tank fits underneath giving the grill a little extra stability and it also helps to contribute to its space saving design. For the first cook I decided on grilling some cheeseburgers. I opened the lid of the grill and then turned the knob on the propane tank to open. After that I turned the control knob on the grill to the small flame symbol which then automatically lights the burner. Once that was done I rotated the control knob to 5 to allow the grill to preheat which took a little over 10 minutes time. 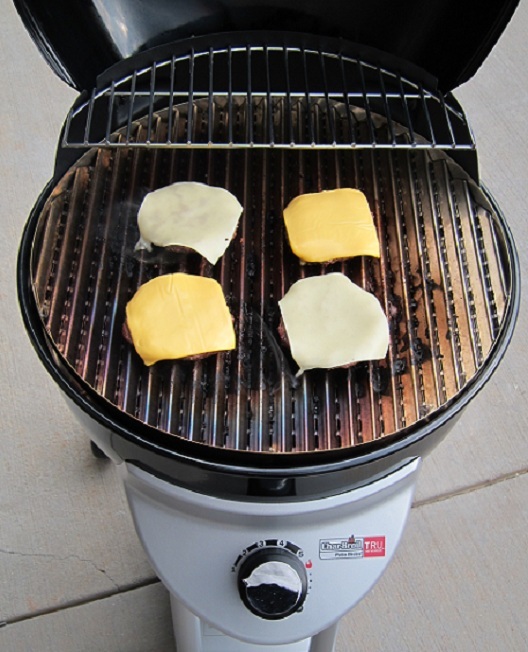 Once the grill was up to temp I put the burgers on and then turned the grill control knob down between 1 and 2 for the remainder of the cook. When the burgers were pretty much done I placed some slices of cheese on them. After that I brought them into the house for dinner. 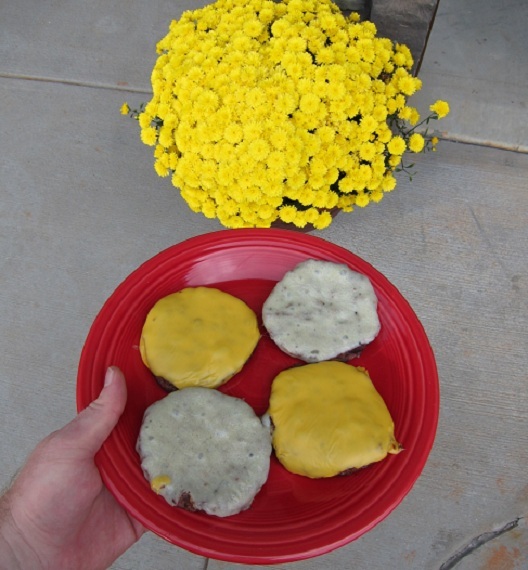 The cheeseburgers cooked perfectly on the Char-Broil Patio Bistro Infrared Gas Grill and my whole family really enjoyed them! 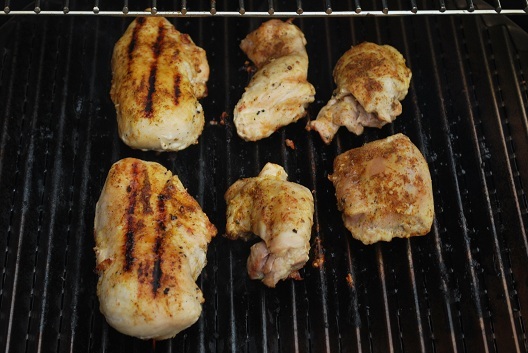 For my second cook I decided on grilling some chicken. I followed the same steps as above to light the grill and kept the grill control knob between 1 and 2 for the full cook. Once the chicken was fully cooked I brought it into the house for dinner. 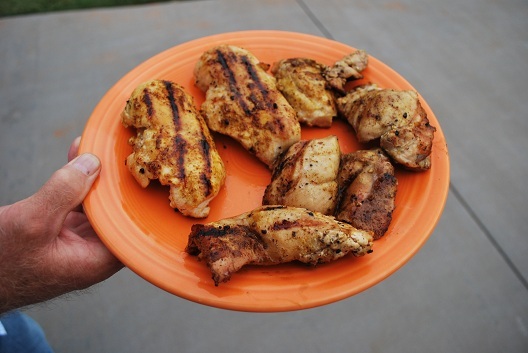 The chicken was a big hit with my family, especially our 4 year old daughter. I tend to use charcoal grills more during my every day grilling, but I have to say this is one pretty nice compact gas grill. 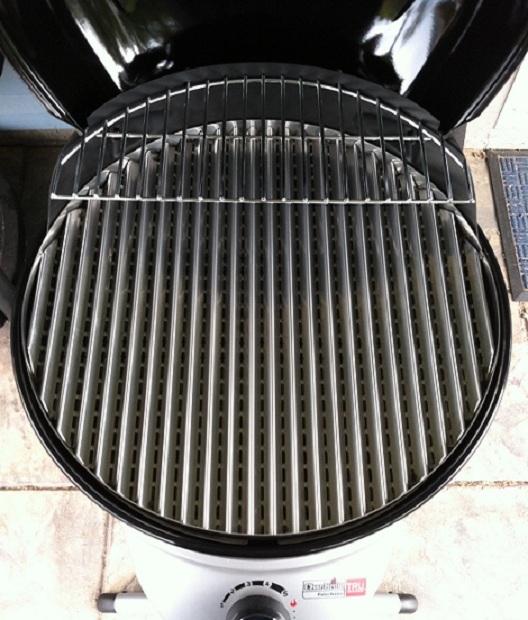 This grill was very easy to use and clean up was quick as well. I also love the compact design of this grill as it takes up very little room on our back porch. I personally couldn’t find anything that I didn’t like about this grill. 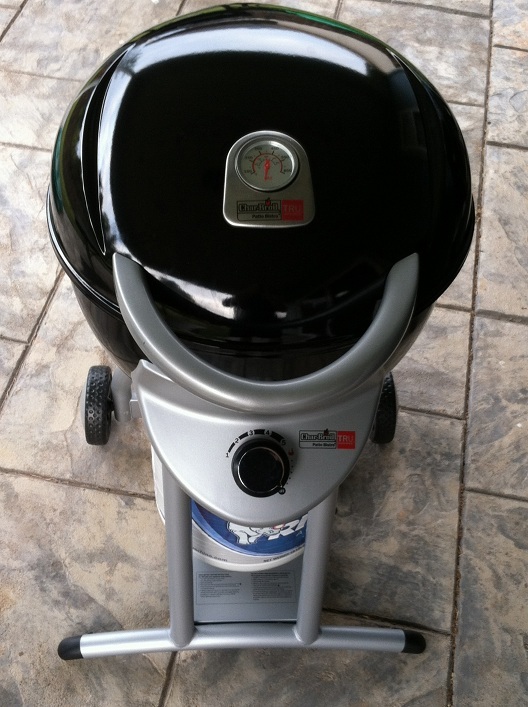 I enjoyed using it and it did a great job of cooking all the food I grilled on it. If you’re someone that is in the market for a compact gas grill because of limited outdoor space, then this grill is definitely worth looking into! 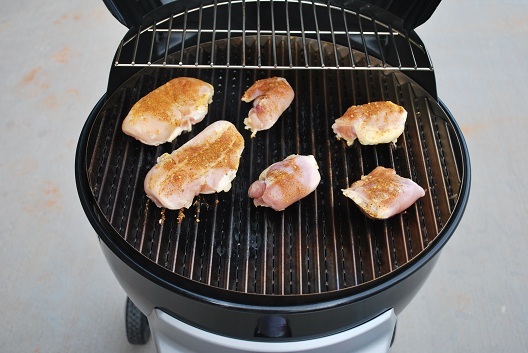 You can find a great deal on the Char-Broil Patio Bistro Infrared Gas Grill here. 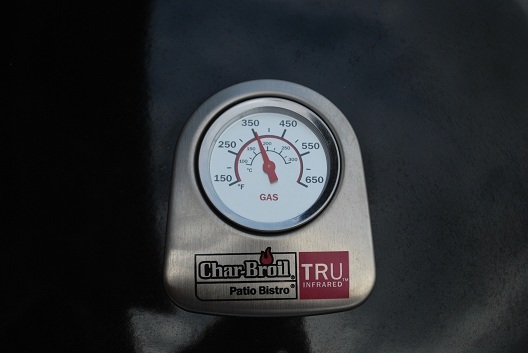 For more information on the Char-Broil Patio Bistro Infrared Gas Grill please visit Char-Broil’s Facebook & Twitter pages as well as their Website. Nice. I might mention this to my mom because she needs a smaller grill, but she’d enjoy the convenience of a gas grill. Thanks for leaving a comment Mark! 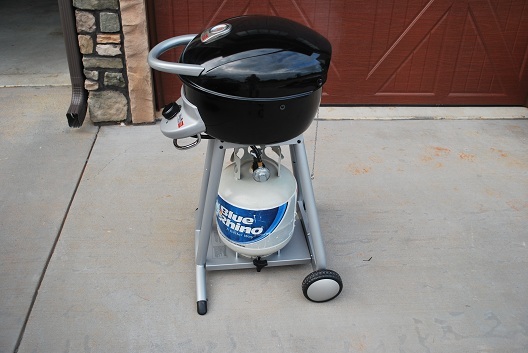 Yeah if she is in the market for a great compact gas grill I would definitely have her look into this one. It’s very easy to use and takes up very little space. Let me know if she ends up getting one. Thanks again Mark! Thinking of purchasing this grill since my condo has limited space. 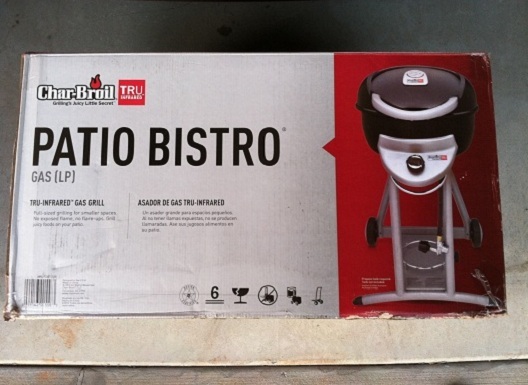 My boyfriend thinks I should go with the Char-Broil 26,500 BTU 2-Burner Gas Grill, 280 Square Inch because it has side tables to put a clean plate etc on but I love the space saving size of the Patio Bistro. Did you find the lack of table inconvenient? I know Char-Broil makes a side table to affix to the Patio grill but not sure I want to spend the extra money. Thanx! Thanks so much for the question! I could see where not having side tables could be an issue for some since it’s more convenient having them, but the great thing about the Patio Bistro is its space saving design. As long as you guys don’t mind bringing the clean plate or other grilling tools out with you once the food is done, then I would personally recommend the Patio Bistro. Do you have a patio table you could use to set your clean plate etc.? Like I mentioned above, I think it’s more convenient to have side tables, but not a necessity in my opinion. Let me know what you end up getting! Thanks again for posting your question! Great review Jay. Looks like a great thing to take tailgating as well. Thanks Ernie! I appreciate it! Okay…this just hit my wish list!! Thanks so much for leaving a comment Jerrilynn! Based on your review I went ahead and bought this gas grill; I am happy I did. It fits perfectly on my condo patio and works as described. I have a small patio table next to the grill that I use as a side table. No issues on lighting the grill, heating up, and cooks food thoroughly.